Length: 3 hrs. 34 min. God is the ultimate restoration expert. He is inviting you to join Him in a process . . . a process of restoration and freedom. There comes a time in every man’s journey with God where tips and techniques simply do not work. 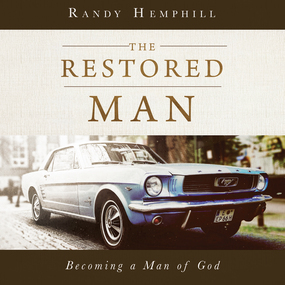 The Restored Man is not another book to read or religious box to check. It is a practical, life changing path for every man to take into to a deeper and healthier relationship with God and others. This process helps explore four key areas of restoration in a man’s life: Know God as Father Know Your Self Live in Brokenness Walk With God The results of this process are measurable. Stop trying to change a behavior, and let God buff out the rough edges of the heart. He’ll take care of the rest. BONUS feature: Online video segments are available that coincide with each area of restoration. Plus, you get to see a really cool, old car.